The first state in the nation to launch a recreational marijuana industry has set a new bar for cannabis revenues. Colorado dispensaries and rec shops recorded $996 million in medical and recreational marijuana sales last year, according to calculations by the Denver Post. That’s an increase of nearly $300 million from 2014, the first full calendar year of rec sales in Colorado, when revenue totaled just under $700 million. 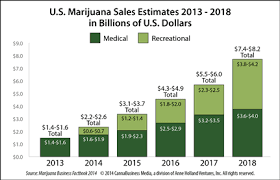 In 2015, rec sales totaled $588 million while medical marijuana revenues hit $408 million. The growth in sales signals that Colorado’s market may yet have not reached its full potential, even though many view the state as already saturated with retailers and growers. Last year saw the entrance and opening of plenty more businesses across the state, as well as acquisitions by growing chains that are looking for smaller companies to absorb. One question for the future of Colorado’s market, however, is whether it will face more competition for marijuana tourists if more states legalize adult use in November, such as Arizona, California, Nevada, and others. If any of those three do legalize rec, it could cut into Colorado’s market share when it comes to recreational marijuana sales.